Time: First sighting 1907, planned expedition to search for it in 2003. The Congo, according to cryptozoology, is crawling with many kinds of undiscovered, rather sensational creatures. Various dinosaur-like creatures, pterosaurs, giant bats, river serpents, giant slugs, all these frankly unlikely and mythical-sounding beasts are said to lurk there. There have been claims that unusual kinds of undiscovered elephant live there too, one of which, the Congolese Pygmy Elephant, turned out to be quite real (despite simply being a morphological variant of the Forest Elephant). The Water Elephant of the Congo River has remained obscure, a supposedly amphibious creature that retreats into rivers and lakes when threatened. Early reports describe it has having a relatively longer neck, spreading toes, shorter legs, and much shorter trunk than typical elephants, to the point that it has been compared to a tapir. The idea of an African tapir seems unlikely, as no fossils of this group have been found in Africa at all. However, at the very least, a stumpy, hippo-sized elephant is far less ridiculous than supposed dinosaurs and pterosaurs. As to its existence, precious little further evidence has been forthcoming since the supposed sightings starting in 1907. Some new sightings prompted Bill Gibbons, creationist researcher, to plan an expedition to find it, apparently to no avail. There is a chance that this creature could be another hoax, mis-identification can be ruled out, unless the observer was simply looking at typical elephants, later recalling differences that were not actually there. Cryptozoologists have suggested that it could be a very primitive elephant, like Moeritherium or a small Deinotherium, but for our speculation, we feel that we should steer clear of yet another prehistoric survivor. The Water Elephant (Potamelephas brevirotsrum) is rarely seen, spending most of the daylight hours either submerged or nearly so; they venture onto land at night to feed, mainly on tall grasses and reeds. In general appearance, they look like an intermediate between hippo and elephant, and are about as large as the hippopotamus. A flexible, muscular neck, and oval-shaped head bearing a short trunk, allows this creature to lift its head out of the water to scan for danger, as well as to use its proboscis as a snorkel. It is unique among recent elephants in that the toes are separate, and spreading, something like those of a hippo. 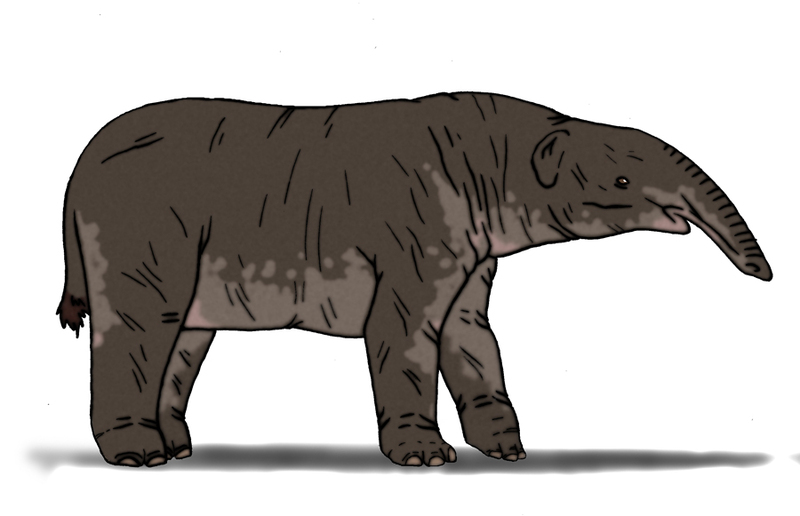 This, along with its shorter trunk, suggests that this animal belongs to a separate offshoot from typical modern elephants. We can theorise that a relatively unspecialised ancestor, something like the gomphotheres that gave rise to mammoths and elephants, also gave rise to this aquatic elephant, perhaps in the early Miocene. During this path of adaptive radiation, the compact toes became separate, to bear weight on muddy ground, and the relatively long trunk was shortened to a simpler, abbreviated snorkel. Inspection of a Water Elephant skull reveals vestigial, un-erupted tusks in both upper and lower jaws, confirming that its recent ancestor was a gomphothere. Like the hippopotamus, the Water Elephant’s dark skin can cause it to overheat on land, and thus it will often bathe simply to cool off or play. Mainly inhabiting parts of the Congo River floodplain, it prefers areas where hippopotamus are less common.